This year we were lucky enough to host our first wedding here at the Cortijo El Cachete. The beautiful couple wanted a simple wedding with close friends and family and felt that the Cortijo El Cachete was the perfect wedding/holiday venue. 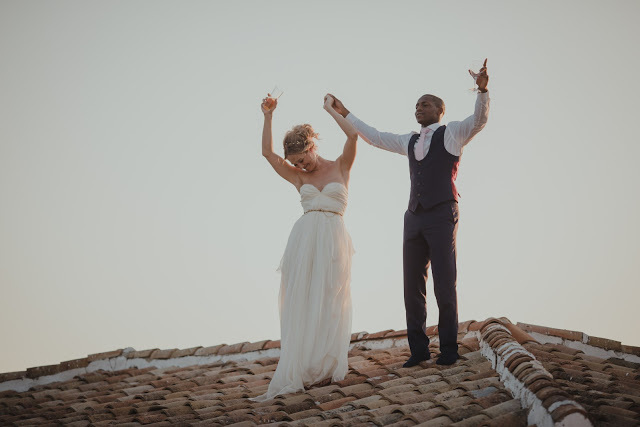 The ceremony was held in the beautiful Hotel Bobadilla just a five minute drive up the road and the reception took place in our gorgeous house and grounds. The lovely couple were kind enough to share their photos with us so we thought we should show you what a wedding here at the Cortijo El Cachete looks like. Whilst we do not have a 'wedding planner' to take care of all the finer details, we are always open to hosting any sort of party and are more than happy to help with planning. Having 13 bedrooms, each large enough to have a double bed, the Cortijo El Cachete makes for the perfect party venue especially as each room is en-suite. The size of the property along with the size of the pool means that all your guests can have a more than comfortable stay. If you're interested in booking El Cachete for your holiday or if you have any reviews, feedback or if you'd like to share your holiday photos with us! We would love to hear from you.